NIA CHARLESTOWN NEVIS (November 24, 2016) — The following is a press release from the Ministry of Foreign Affairs in St. Kitts and Nevis dated November 23, 2016, regarding Minister of Foreign Affairs Hon. Mark Brantley’s visit to the United Arab Emirates (UAE). Today, marked another significant milestone in the relationship between St. Kitts and Nevis (SKN) and the United Arab Emirates as Ministers of both countries met in Dubai to sign a Double Taxation Agreement and an Investor Protection Agreement. Both agreements were signed by the Foreign Minister of St. Kitts and Nevis Hon. Mark Brantley and H. E. Obaid Humaid Al Tayer, Minister of State for Financial Affairs of the UAE. In a high level ministerial meeting before the signing, the importance of the agreements and the growing friendship between the two countries was emphasized. Both agreements follow on the historic Air Services Agreement also signed between the two countries a few days earlier. They are part of a suite of agreements and memoranda of understanding which create the enabling framework for investment and government-to-government and people-to-people contacts between the two countries. In his comments, H. E. Al Tayer thanked St. Kitts and Nevis and the rest of the Caribbean for their support of Dubai’s successful bid to host the World Expo 2020 and renewed his government’s commitment to assisting the development of St. Kitts and Nevis and the Caribbean region. He called on the Caribbean to create greater awareness of that region and its attractions for business and leisure within the UAE and the Middle East. 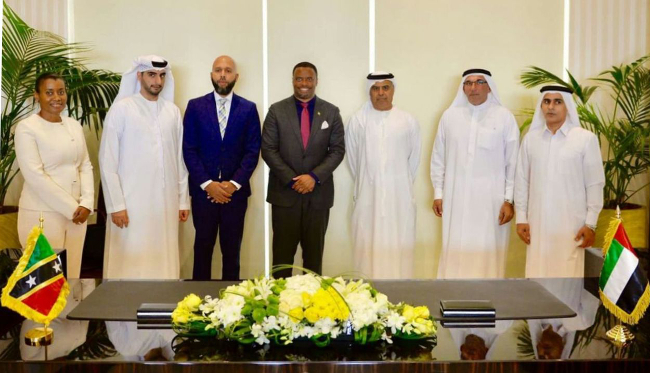 Foreign Minister Brantley, emphasized that St. Kitts and Nevis was among the first of the Caribbean nations to establish a formal diplomatic presence in the UAE and welcomed news that other Caribbean nations were now seeking to do likewise. He also underscored the value of deeper relations between the UAE and the Caribbean Community (CARICOM) region as together those regions shared the same ethos of peace, political stability, national progress and citizen prosperity. Both Ministers pledged to continue the important dialogue in the UAE and in St. Kitts and Nevis at the diverse multilateral fora available to them. Minister Brantley, extended a formal invitation to Minister, H.E. Obaid Humaid Al Tayer to visit St. Kitts and Nevis and thanked him and his Government for their warm hospitality. After the meeting, a clearly euphoric Minister Brantley stated, “St. Kitts and Nevis is open for business and these agreements create a welcoming environment for citizens and residents of the UAE to invest in and play a role in the development of our beloved country. The Foreign Minister is accompanied by St. Kitts Nevis Consul General Justin Hawley and Deputy Consul General Elsa Wilkin Armbrister.